The SCK (Shin Chuo Koggyo) is the new name for the old NEW NAMBU company. 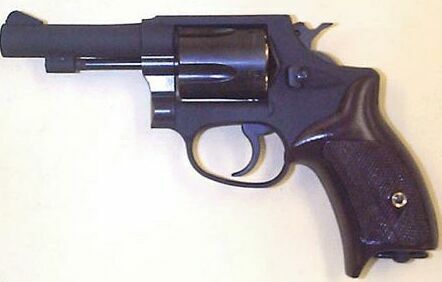 This japanese firearms company have manufactured since the '60s a .38-Special revolver, obviously fed from a 6-rounds capacity revolving cylinder, which armed their police and coast guard until the '80s (while their Self-Defence Forces, or Army, was equipped with the M57-B, which is a japanese copy of the Colt M1911-A1 .45-ACP american semiautomatic handgun), when it was replaced by several semi-automatic handguns, although some of the "elder" police officers still retain it in service. The SCK M60 was available in 2 versions: the M60-51 (2,5" long barrel version, a.k.a. 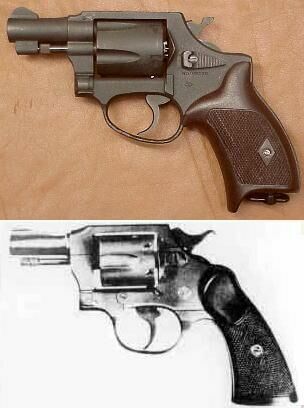 the SPECIAL POLICE) and M60-77 (4" long barrel version, a.k.a. the CHIEF'S SPECIAL).